Over the past two weeks, both the State Senate and Assembly met to pass a wide range of legislation before breaking for the winter holidays. Among some of the more controversial bills was Assembly Bill 455 authored by Representative Rob Stafsholt (R – New Richmond). The bill allows children under 10 to hunt without a requirement to complete a hunter’s safety course. Proponents say the bill encourages growth in Wisconsin’s hunting heritage. Opponents expressed safety concerns for hunters of all ages. The bill ultimately passed the Assembly on a 57-32. It was a rare instance in which there was bipartisan support both for and against the bill. The State Senate passed the bill on a nearly party-line vote of 21-12. Democratic Senator Janet Bewley of Ashland joined her Republican colleagues in supporting the measure. Another contentious bill, Assembly Bill 499, is headed to the governor’s desk. The bill, authored by Representative Rob Hutton (R – Brookfield) and Senator Tom Tiffany (R – Hazelhurst) removes the state’s current requirements on companies interested in sulfide mining. Under current law, companies have to prove a sulfide mine can operate for 10 years and be closed for an additional 10 years without polluting the environment. The bill removes the requirement to provide that proof. Proponents argued current law essentially bans any ability for a company to develop a sulfide mine in the state. Opponents worry such mining operations will pose serious risk to Wisconsin’s water resources. The bill passed the State Assembly 53-38. Republican representatives Jeff Mursau, Todd Novak, Pat Snyder, and Travis Tranel joined Democrats in opposing the bill. The Senate voted to pass the measure 19-14 with Republican Senator Robert Cowles voting against. Perhaps the most controversial piece of legislation taken up by the State Senate was actually an Assembly Joint Resolution authored by Representative Dan Knodl (R – Germantown) and Senator Chris Kapenga (R – Delafield). 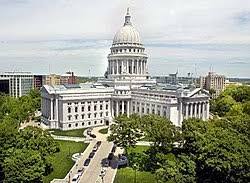 Assembly Joint Resolution 21 submits an application to Congress urging that body to call an Article V Convention for proposing amendments to the U.S. Constitution. Specifically, the convention would be for the purpose of drafting a balanced budget amendment for the federal government. The resolution asks Congress to call such a convention as is allowed under Article V of the United States Constitutions. Under Article V, if two thirds of the state legislatures submit applications for a convention, Congress shall call “a convention for proposing amendments”. If the convention drafts language for an amendment, the amendment must be ratified by three fourths of the states. Proponents of the resolution say they want to reign in government spending through such a process. They maintain the only goal of a convention is to propose a balanced budget amendment. Opponents argue there’s no way to control what the convention chooses to do. Legal scholars do not agree on whether or not an Article V convention could actually rewrite the entire U.S. Constitution and decide not to require three fourths of the states to agree. AJR 21 passed the State Assembly in June on a mixed vote of 54-41. On November 7, the Senate passed it after many hours of debate 19-14. Senator Roger Roth (R – Appleton) was the only Republican to oppose. The resolution does not require the governor’s signature in order to be sent to Congress. The legislature is now in recess until January. However, legislators will still likely be active with committee work.